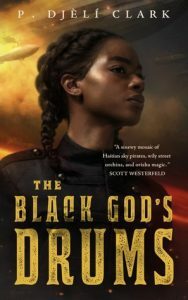 I received a copy of P. Djèlí Clark‘s The Black God’s Drums through Netgalley. Creeper, a scrappy young teen, is done living on the streets of New Orleans. Instead, she wants to soar, and her sights are set on securing passage aboard the smuggler airship Midnight Robber. Her ticket: earning Captain Ann-Marie’s trust using a secret about a kidnapped Haitian scientist and a mysterious weapon he calls The Black God’s Drums. Man, Tor.com has put out some stellar novellas lately! (And those covers, so pretty.) This was short, true, but it packed a mighty punch. The language, world-building and characters grip you and it managed a full story in 110 pages. I do generally prefer longer works and I think this would have lent itself to being longer. (Though I realize Tor specializes for shorter works.) All in all, two big thumbs up from me. I’ll be looking for more of Clark’s writing. This entry was posted in books/book review and tagged book review, fantasy on September 19, 2018 by Sadie.